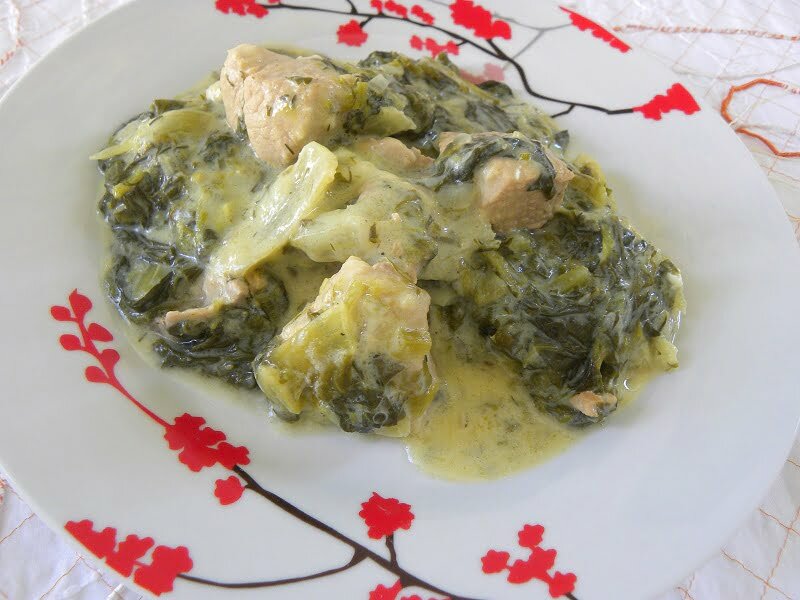 Greek fricassee refers to a method of cooking meat or vegetables in avgolemono sauce, (which means egg and lemon sauce). Here, pork is cooked with lots of lettuce and aromatic herbs . Instead of lettuce, I also make it with stamnaggathi, purslane and almyra greens. The flavour of the meat cooked with the lettuce and then the egg and lemon “avgolemono” sauce added at the end is simply fantastic. Just after we got married we left Cyprus and came to live in Greece. My husband was an officer in the Greek army, so we were transferred to a small village in Northern Greece, called Rodopolis, Serron, a place far away from his family. I practically had no one to turn to when I needed help (neither did we have the internet then to look for recipes) and overseas or long distance phone calls cost a lot. I did, however, have a cooking book and gradually I learned some new things about cooking but I am sure no recipe book will ever tell you how to fry potatoes or other easy things. I learned the hard way and it took some time to learn everything. This is what I have in mind whenever I give a recipe. I have in mind that there are some other people who do not know the obvious things. Eventually I made some new friends and we would swap recipes. This is how I learned some new Greek recipes which we did not cook in Cyprus. One summer, when we went back to Cyprus, on holidays I cooked for my family some of the new recipes I had learned and one of them was Fricassee. My mother liked it very much and I told her how to make it. Of course, she never wrote the recipe down and as she was growing old she couldn’t remember the whole recipe when she decided to make it. A few years later, when we visited Cyprus again, my mother made fricassee for us but it was somehow different. She forgot the recipe and added tomato to it. It wasn’t bad but we laughed with her. Years later I found out that at some parts of Lakonia (where my in-laws live) they do add tomato to their fricassee, as well as to the traditional Easter dish called “Magiritsa”. I don’t know the origin of this recipe but I assume this was originally a French recipe, as fricassée is a French word. The French recipe is a stew, usually with a white sauce, as wine and cream are used. It is usually made with all kinds of meat, poultry, fish, and even vegetables alone (see my recipe for Thyme Chicken Fricassee), sometimes cooked with vegetables such as mushrooms, shalots, aromatic herbs etc. Nicolas Tselementes, a famous Greek chef, who studied in Vienna and worked abroad for many years, introduced French cuisine to the Greeks, at the beginning of the previous century. However, I checked his cookbook, named after him, and his Lamb fricassee has no lettuce in it and is totally different than the way fricassee is now made. Cut the meat into medium portions, wash and strain. Wash and cut the lettuce into 3 cm (1-inch) pieces, which boil for 5 minutes and then strain. Heat the olive oil in a saucepan and sauté the meat on both sides. Add the onions and celery and sauté them until the onion becomes translucent. Add salt, pepper, and water to cover the meat and bring to a boil. Reduce the heat and simmer until the meat becomes tender. If needed, add more water until the meat is cooked. Add the strained lettuces as well as the dill and parsley and cook for another 15 – 20 minutes. Remove from the heat and set aside for 10 minutes. Prepare the avgolemono sauce. See video how to make it here. In a separate bowl, beat the eggs and add the lemon juice. While beating the eggs, add the corn flour and mix until it dissolves. Take a ladle of stock from your pot and slowly add it to your egg and lemon mixture while whisking. Add avgolemono into your saucepan and mix. Leave it to rest for 15 minutes and then serve. This recipe can also be made with lamb or chicken. The cooking time for the lamb is the same, whereas chicken takes about 30 minutes to cook. Ivy, I love fricasse dishes. My monm will often use lettuce leaves as you do. I just checked my old Tselementes and see that he has a recipe for Frikase using lettuce. I wonder if it was Tselementes that introduced the word frikase — his reputation is of trying to frenchify Greek cuisine, and thus make it seem more upscale. I can see how one might call this pale colored stew, which is what frikase AND friccasee are after all, by the French name. It’s kind of like when I try and explain Pastitsio to people, I often say, it’s sort of like lasagna, which is true and not true at the same time. (Pale that is, unless you add tomato!!!!!) Thanks for an interesting post, and a good story about learning to cook! Hi Laurie, I’ve got an old Tselementes and just checked it out. I’ve stopped using it ages ago. Anyway, I see he is almost doing it the French way by adding the milk and yoghurt. Ivy, here’s something weird for you. I had checked a 1950 Tselementes I have in English. The frikase there is just as you write it — cook the meat until it’s done, and then whisk in the eggs and lemon juice. I also have a 1969 Tselementes in Greek, so I got that out, and by then he is mixing in milk and cornflour.